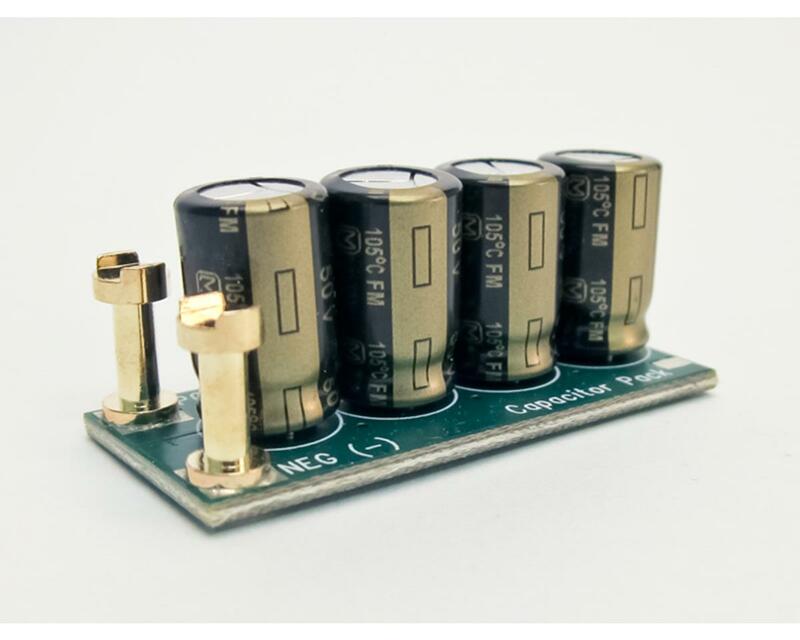 This is the Castle Creations CapPack Capacitor Pack. The CapPack is useful in all brushless motor applications, where it serves to give the boost needed to overcome ripples in the battery voltage caused by hard acceleration or long battery wires. Remember, ripple voltage is hard on an ESC, and adding the CC CapPack can help reduce the load on the controller's on-board capacitors. All Castle controllers with data logging capabilities can report the ripple voltage they encounter during use. Ripple voltage peaks should always be less than 10% of the total pack voltage; the smaller the ripple voltage the better. If an application exhibits more than 10% ripple voltage under peak loads, the user should consider using higher discharge (C Rating) batteries, shorter wires, higher current connectors, better gearing or a smaller load. The Castle Creations CapPack is designed for quick and easy installation. Users simply cut the soft silicone insulation on the battery wires – do this as close to the ESC as possible – and place the exposed wires in the channels on CC CapPack's posts. Check for proper polarity and then solder the wires to the posts. Use the included heat shrink to finish it off for a professional looking install. Helis: CapPack is highly recommended for all 500 class and larger heli applications where Y harnesses and long wires can bleed voltage and hard collective pulls can strain even the most powerful batteries. Cars/Trucks: With their high torque requirements – going from 0 to 100% throttle isn't easy on controllers or batteries - RC cars and trucks put enormous loads on brushless power systems. Use the CapPack to help your system power through the abuse. Aircraft: Larger electric power systems lead to larger electric powered aircraft, and sometimes the distance between the battery pack and the ESC grows beyond the length of the wires installed on the components. Adding wire also adds inductance, which can increase the ripple voltage in a system. The CapPack essentially negates the ripple caused by the addition of up to 8 inches of length to the battery wires. NOTE: Multiple CapPacks may be used in a single application, but should all be installed as close to the ESC as possible. I am just writing this to defend the product against the previous review. The guy clearly doesn't understand what these are for and his results make 0 sense if they where installed properly. Creating more heat and such is an impossibility for caps that are run inline with the wires. They are doing nothing to the current flow. Even if the caps popped, it wouldn't hurt the battery input to the ESC. I use capacitors on all my Vehicles. I'm purchasing this capacitor pack for a 4s vehicle. These stabilize your electrical system. purchased one of these to boost my car running a 2650 KV motor, hobbywing ESC with 2S battery. The only thing this did was add excessive heat to the motor wires and the motor and caused three DNF's. I can't say there was any increase in response or performance. Once removed the car ran just fine and finished races again. Not exactly what I was expecting so you better evaluate if you really need this problem introduced into your system. Mine is going to collect dust in the parts bin.